CURT CHASE received his Bachelor’s Degree in Music Education from Fredonia State College and his Master’s in Music from the University of Michigan. He has 34 years of experience as a school band director, including 22 years at Amherst Central High School. Mr. Chase has taught private brass lessons at Twin Village Music since his retirement from Amherst in 1995. He regularly adjudicates county and state solo festivals, and continues to perform throughout Western NY in a variety of bands. He has played with the Amherst Symphony Orchestra, The Lancaster Town Band, and Buffalo Swing. JEFF GLAUB received his Bachelor’s Degree in Music Education from SUNY Fredonia and is currently completeing a Masters Degree at Buffalo State. Mr. Glaub is a music teacher in the Buffalo Public Schools and has been teaching private brass lessons at Twin Village Music since 2009. He has perforned in a number of local ensembles including the Amherst Chamber Ensemble, Cheektowga Community Symphony, German American Musicians, and the Lancaster Town Band. ANDREA LaBOUNTY received her Bachelors Degree in Music Education from SUNY Fredonia. She is currently teaches instrumental music at the Cauga Heights Elementary School in Depew. Miss LaBounty is a member of the American Legion Band of Tonawanda and is currently working on her Masters Degree. She has been teaching private brass lessons and assisting in the repair shop at Twin Village Music since 2013. Leah Hodge is near completion of her doctoral degree in Trumpet Performance at Indiana University where she studied with John Rommel. 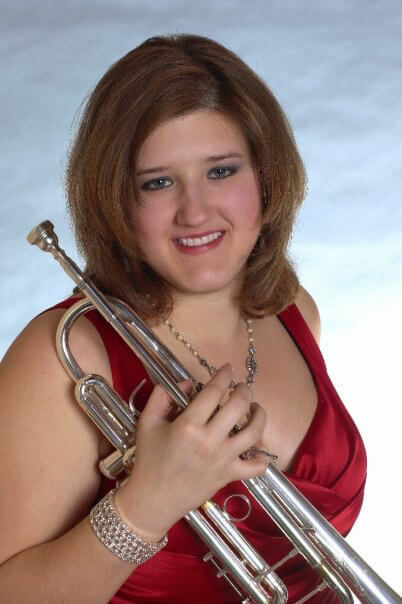 She has studied with Buffalo Philharmonic principal trumpet Alex Jokipii, and William Campbell at the University of Michigan, Ann Arbor, where she received her Bachelor’s Degree in Trumpet Performance. She also holds a master’s degree from the Cleveland Institute of Music where she studied with Cleveland Orchestra principal trumpet Michael Sachs. Ms. Hodge has taught students of all ages and abilities for over fifteen years, and prides herself on tailoring her teaching to each and every student’s individual needs.